This +P load pushes the 9mm Luger cartridge to the higher end of its performance range, firing a light 115 grain jacketed hollow point bullet at around 1,250 feet per second. 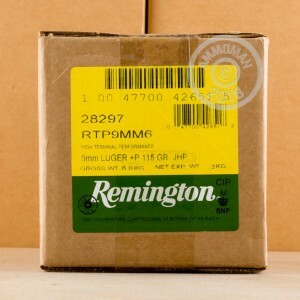 Suitable only for firearms that can handle high-pressure cartridges, these rounds come from Remington's ammunition plant in Lonoke, Arkansas and use non-corrosive Boxer primers and reloadable brass cases. 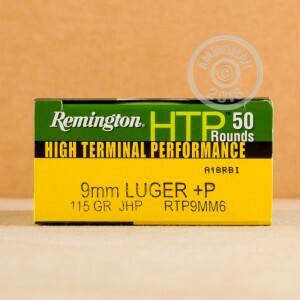 Each box of Remington HTP (High Terminal Performance) ammo contains 50 cartridges, a convenient alternative to the typical 20 round boxes used in self defense ammo and a great way to save. Buy enough boxes to reach an order total of $99 or more and AmmoMan.com will charge you nothing for S&H. Free shipping applies to any combination of items over $99 including virtually all case-priced centerfire pistol and rifle ammo. Bought 200 rounds and ran 150 thru my FNX-9 with no malfunctions. 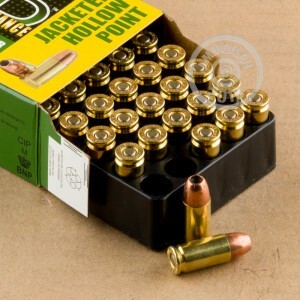 This is just about the only +P hollowpoint ammo where I can afford 200 rounds (love the free shipping). Accuracy was fine--this round will really send a coffee can flying! Good purchase.